I finally mailed out Jessica's b-day gift a month late (sorry again Jabby!) and part of her gift was casual coasters. From her previous posts you know she has been having a dilemma coming up with low cost coasters. I scoured my scrapbook stash and went to work. 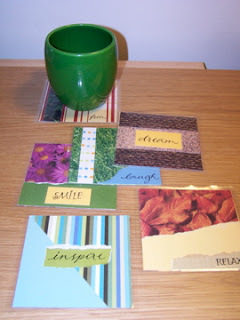 They key is to use card stock as the backing and embellish each square with paper scraps and flat stickers. I have a Xyron machine that laminates so I used that but you could also use regular clear contact paper that can be found @ craft stores or office supply stores. Not a scrapbooker? No problem! Start saving all the cards you get in the mail for holidays and birthdays. It's card stock weight and can easily be cut and laminated. I saved all the cards that my 4 year old got in the mail for his birthday and plan to make coasters out of them. What better way to train a child to use a coaster if the coaster has pictures of Superman on it. This technique may also work on significant others. I thought the days of coasters were over once I had children since most break when thrown or dropped but now I am excited about bringing these into our home. And besides Superman goes with any decor. These coasters are awesome. We use them everyday now. Thanks for a great, useful, handmade gift! The keys are using cardstock and I think having a laminating machine. I tried to make some with magazine cuttings and self pressing lamination but it just didn't work.